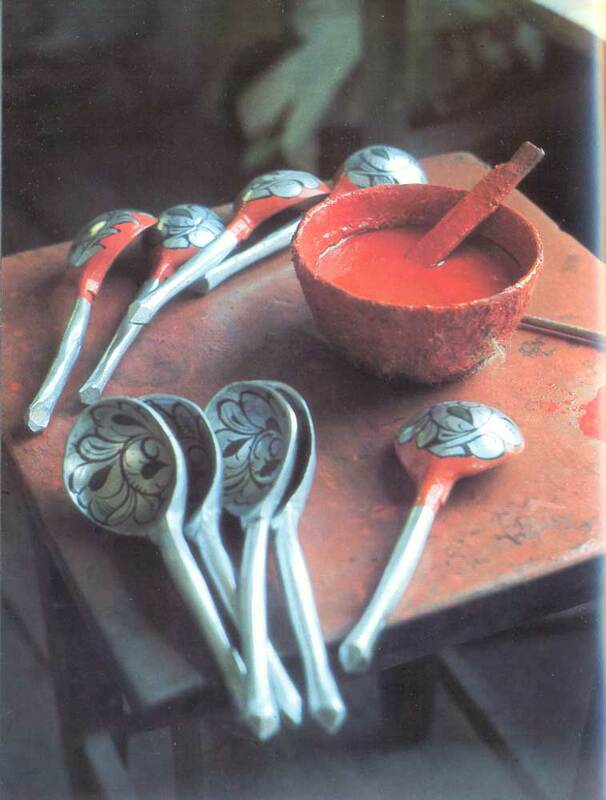 Yekaterina Dospalova and Taisia Belentsova, Lacquered woodcarved ladle, painted in oils against a red background, 1970, Reserve of the Khokhlomskaya Rospis Association, Semionov, Gorky Region, Yekaterina Dospalova and Galina Volkova Lacquered woodcarved ladle, painted in oils against a black background, 1970, Reserve of the Khokhlomskaya Rospis Association, Semionov, Gorky Region. 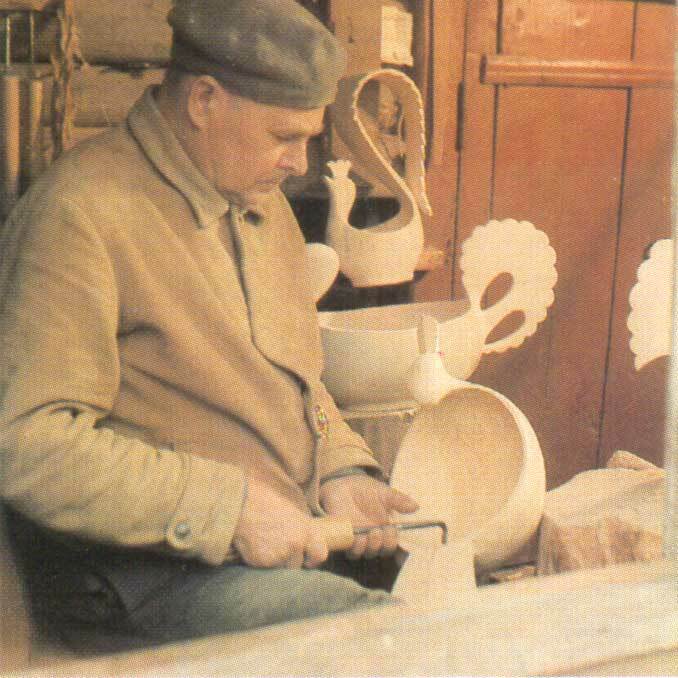 Eldest Khokhloma woodcarver Mikhail Uglanov. Olga Lushina, Saucer The Fire-bird. 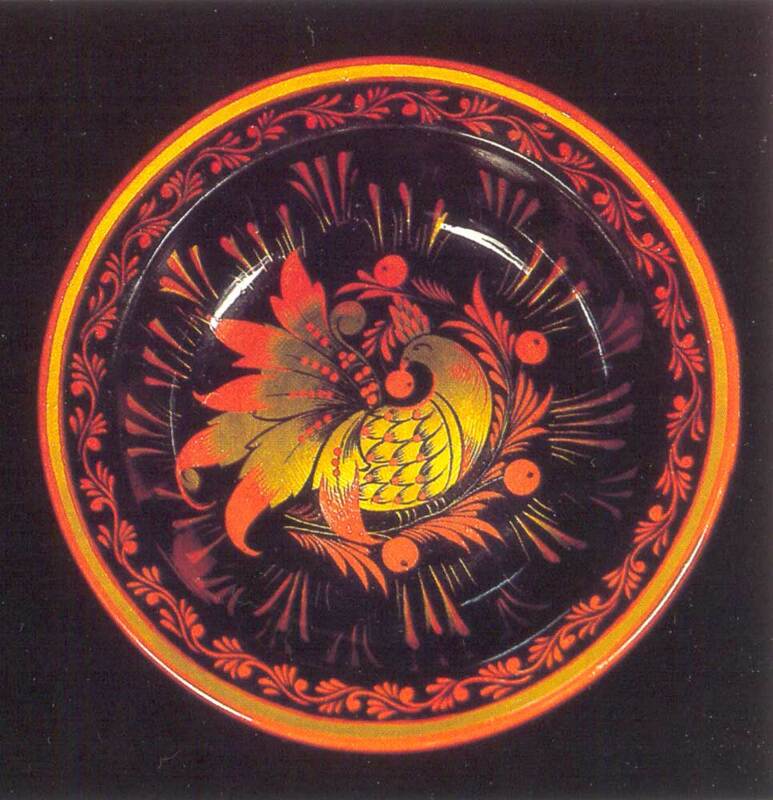 Olga Lushina, Lacquered saucer The Fire-bird of turned wood, with painted decoration. 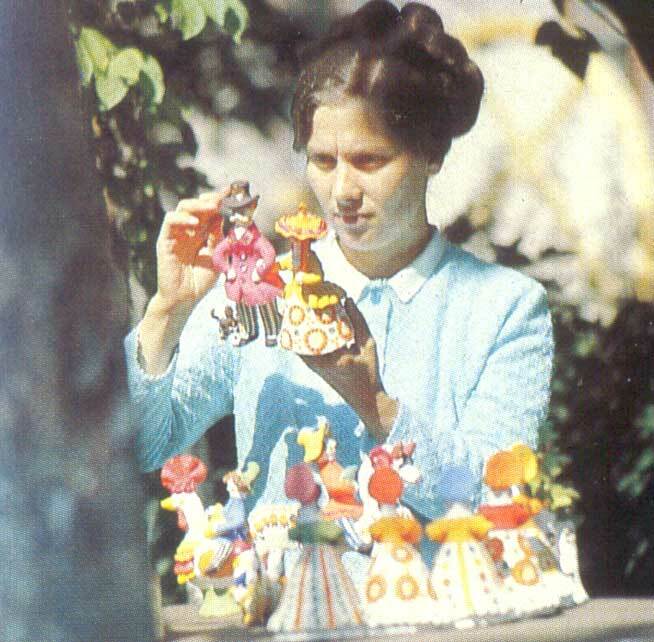 1967, Diam. 18, Nizniy Novgorod Art Museum. 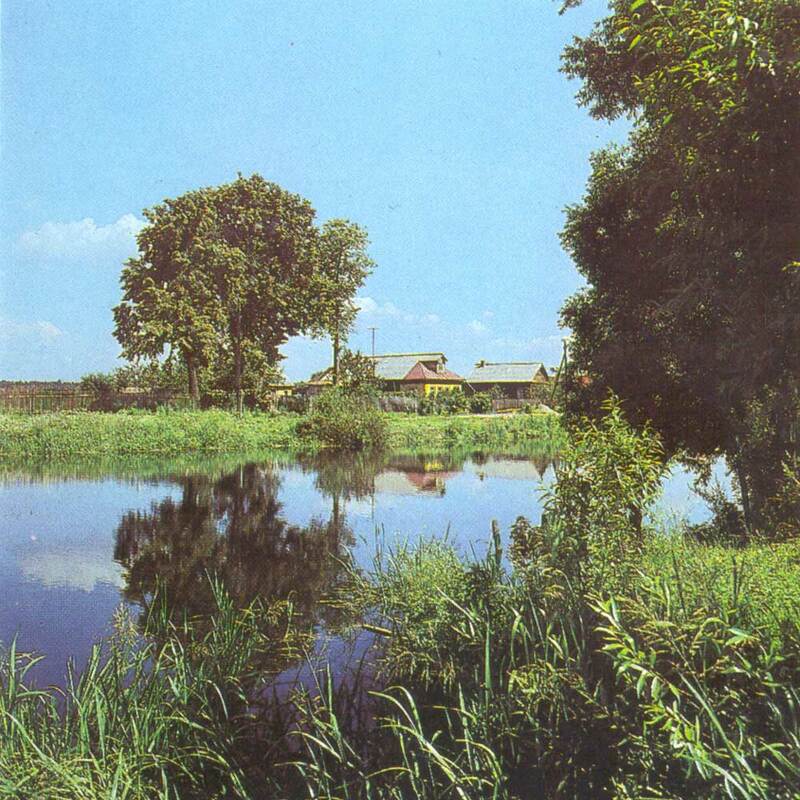 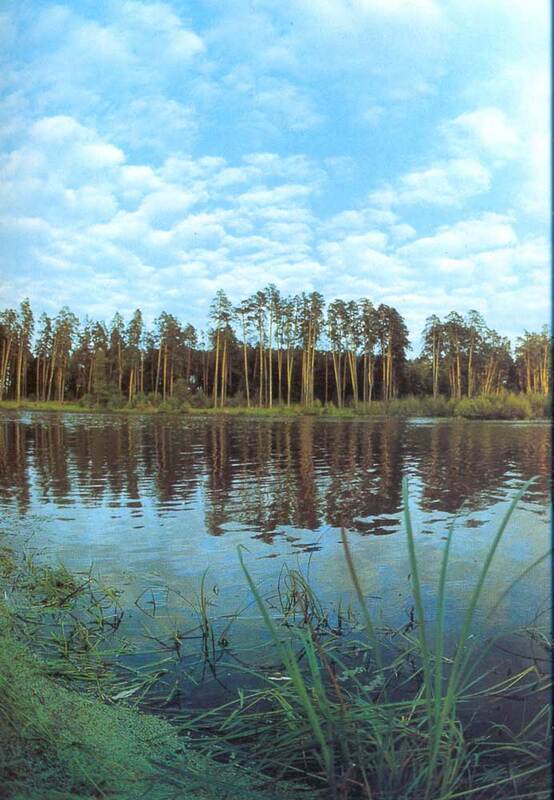 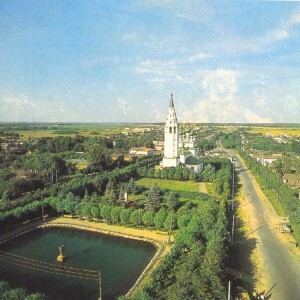 Village of Zhostovo situated near Moscow. 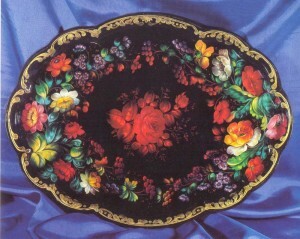 Nikolai Antipov, Tray A Bunch of Flowers on a White Background. 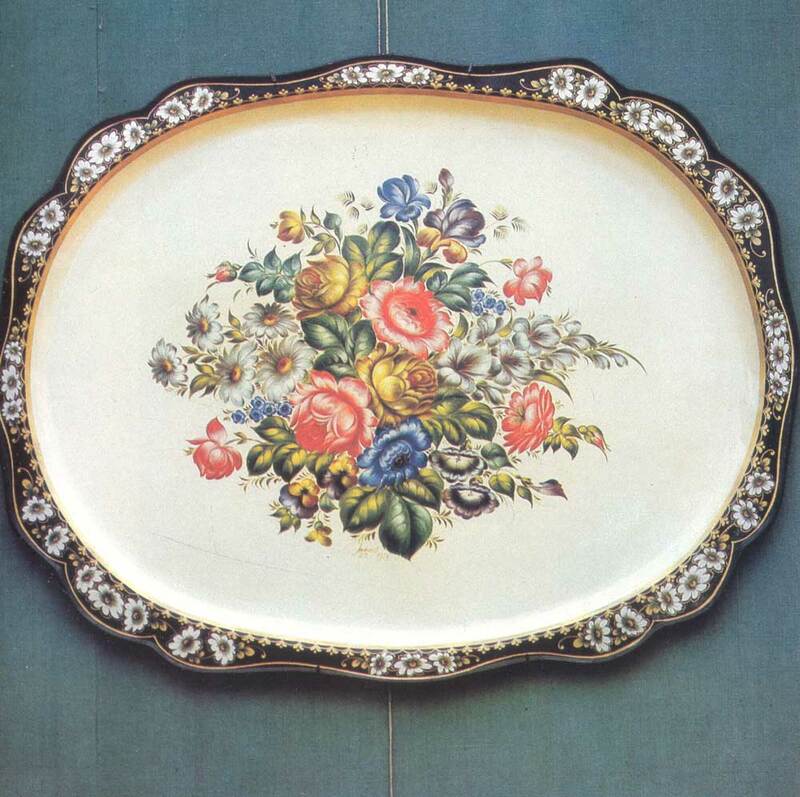 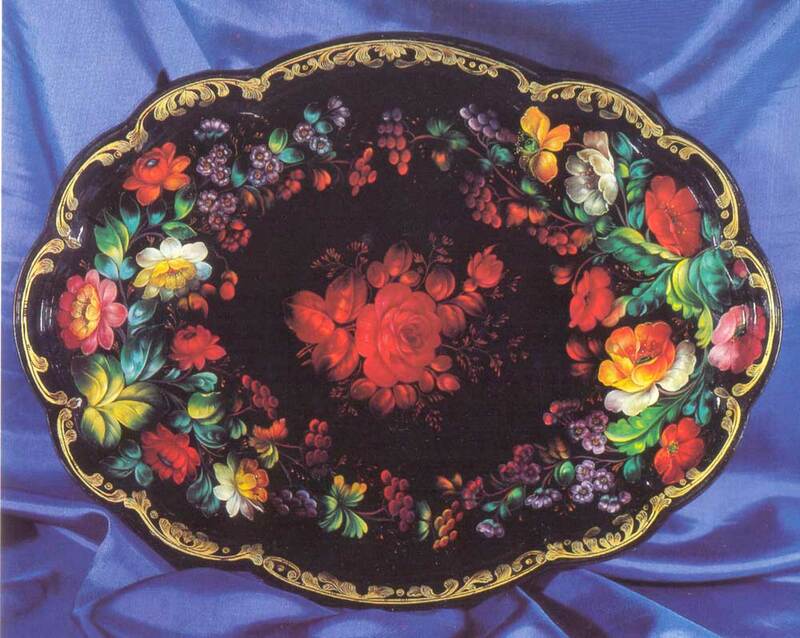 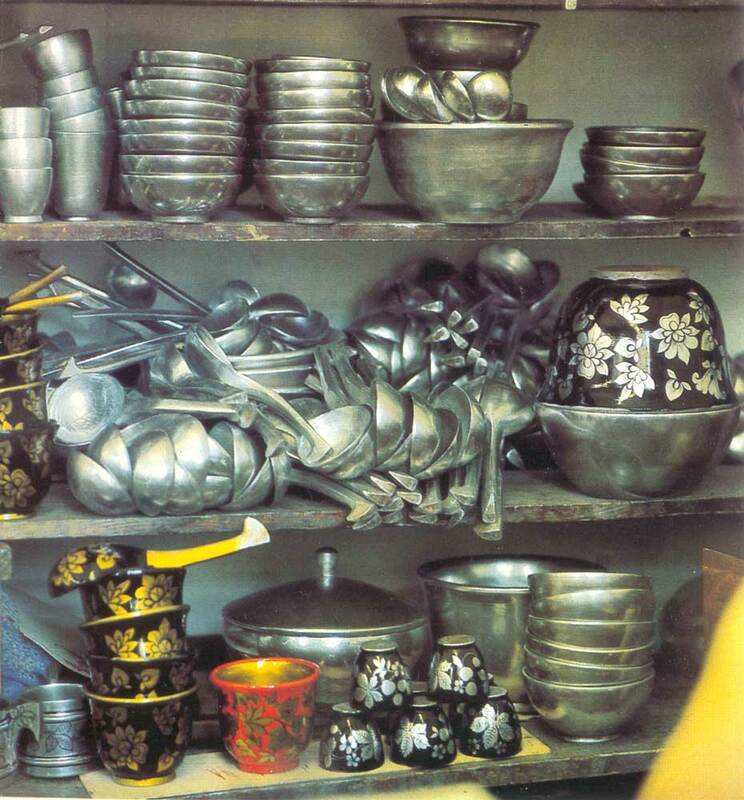 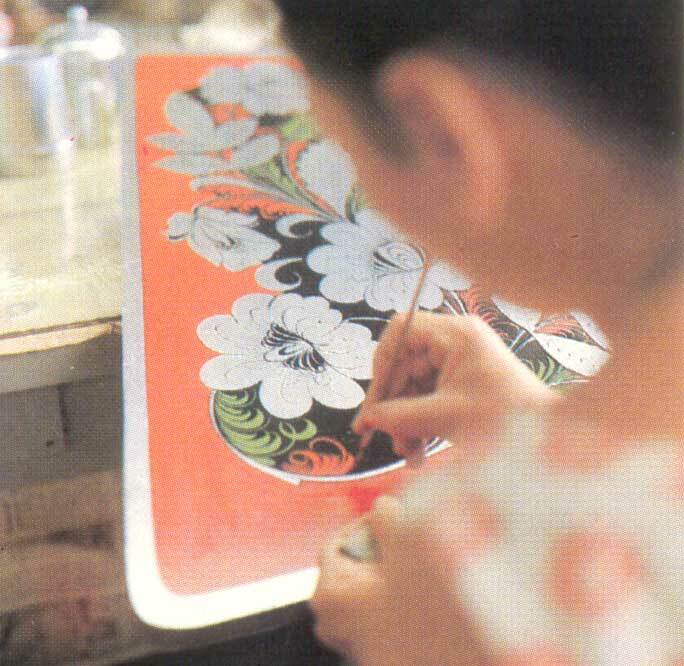 Nikolai Antipov, Lacquered metal tray A Bunch of Flowers on a White Background, painted in oils, 1979, 65×72, Rosizopropaganda Republican Centre, Russian Federation Ministry of Culture. 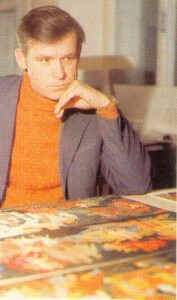 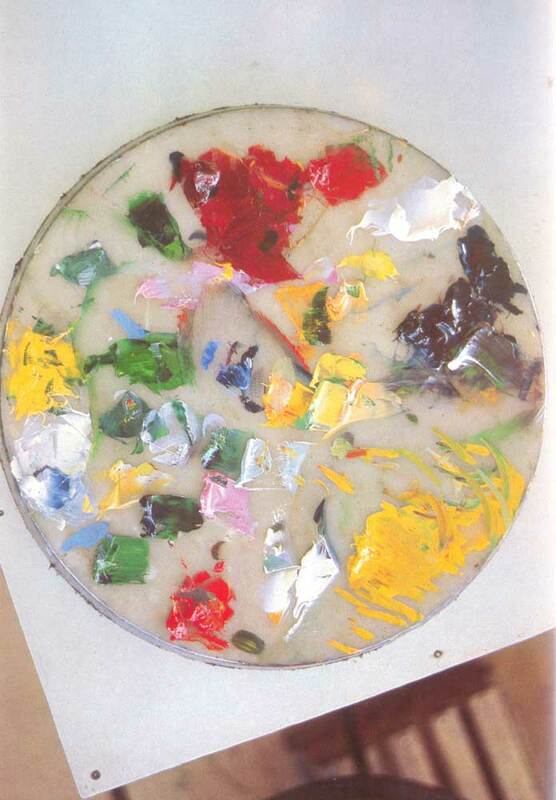 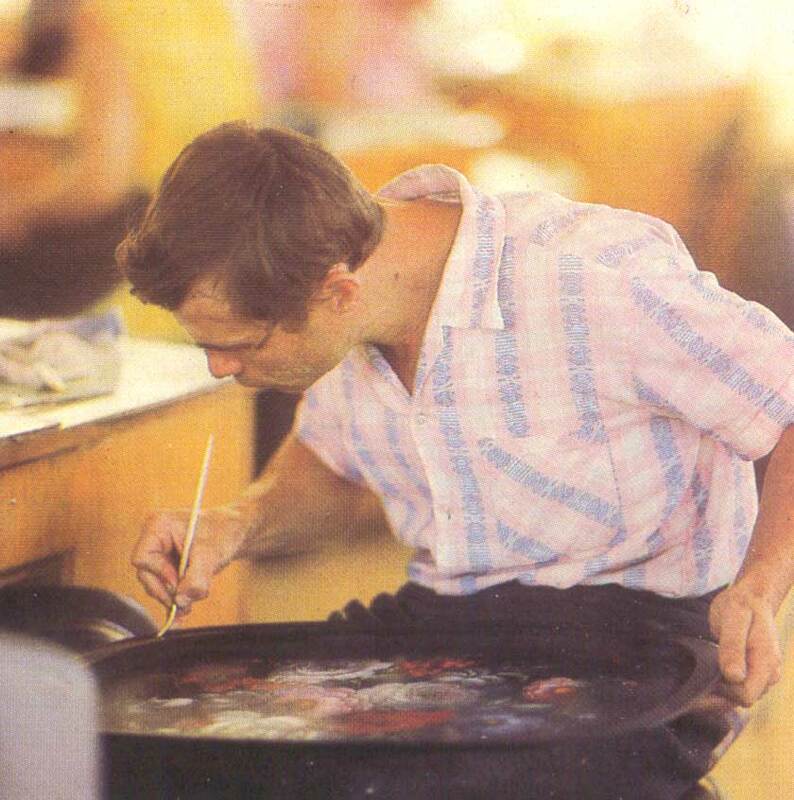 Vladimir Zhmylev, Lacquered metal tray Flame, painted in oils, 1979, 63×76, Rosizopropaganda Republican Centre, Russian Federation Ministry of Culture. Painter Vladimir Zhmylev, Russian Federation Repin Prize Winner. 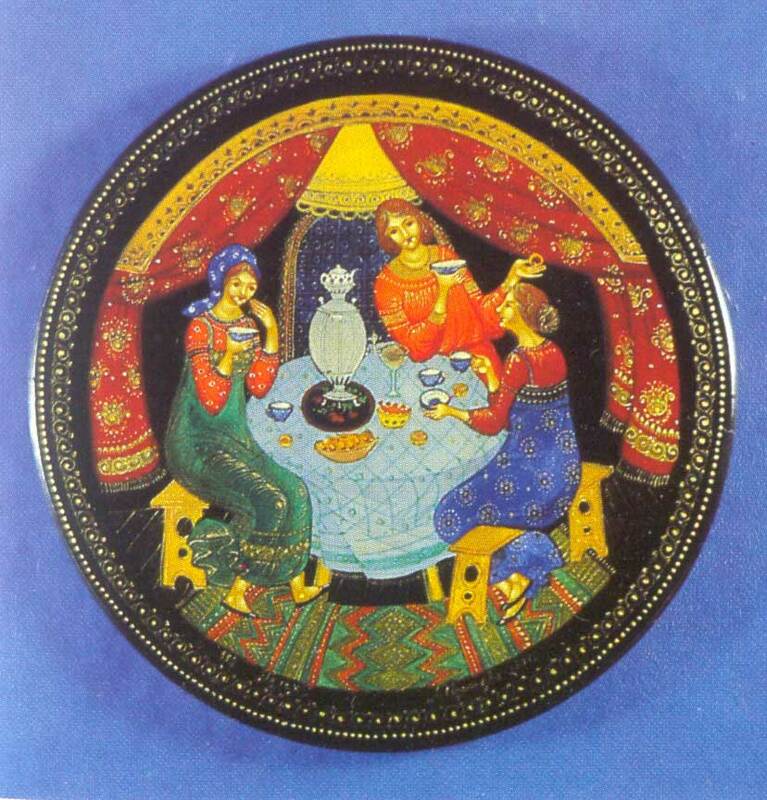 Mikhail Savelyev, Lacquered metal tray A Moonlit Night. 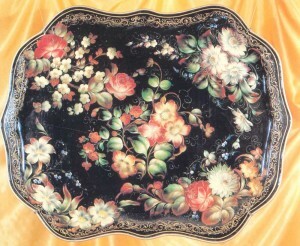 Mikhail Savelyev, Lacquered metal tray A Moonlit Night, painted in oils. 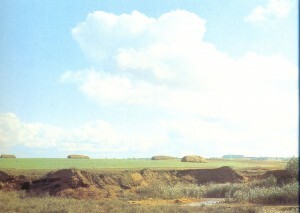 1975, 62×80,Rosizopropaganda Republican Centre, Russian Federation Ministry of Culture. 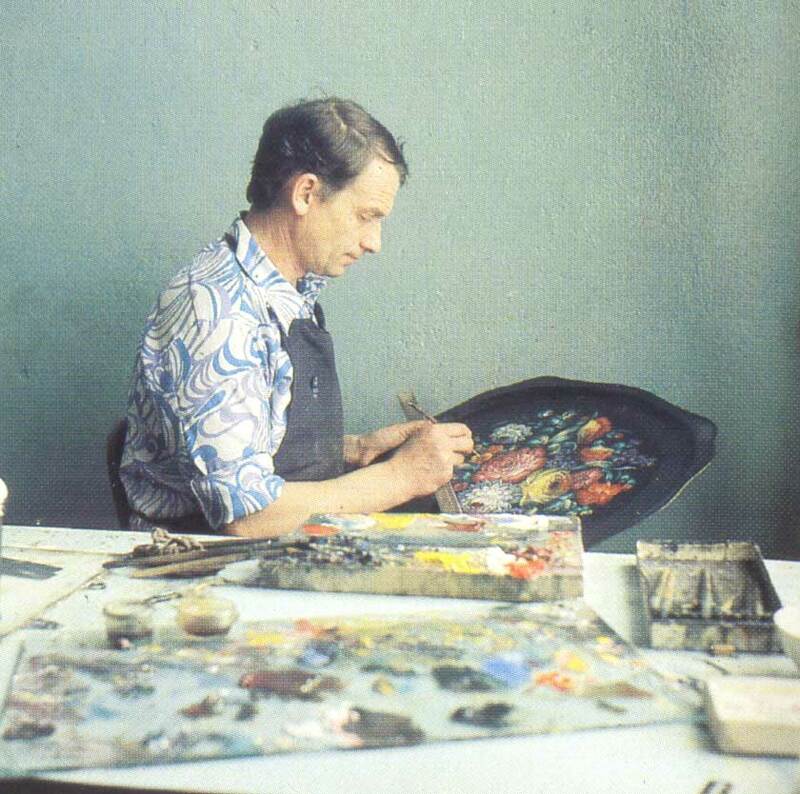 Painter Nikolai Mazhaev, Russian Federation Repin Prize Winner. 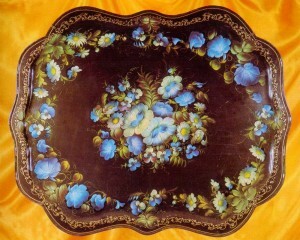 Nikolai Mazhaev, Lacquered metal tray Sunny, painted in oils. 1980, 62×80, Rosizopropaganda Republican Centre, Russian Federation Ministry of Culture. 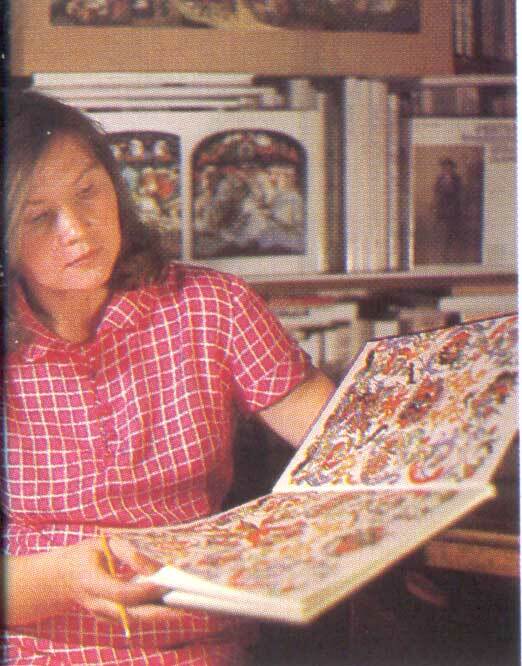 Nina Goncharova, Honoured Artist of the Russian Federation. 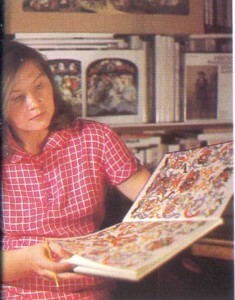 Nina Goncharova, Honoured Artist of the Russian Federation, Russian Federation Repin Prize Winner. 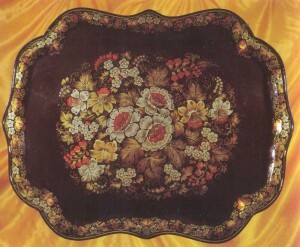 Nina Goncharova, Lacquered metal tray Red Roses, paintedin oils, 1979, 65×72. Rosizopropaganda Republican Centre, Russian Federation Ministry of Culture. 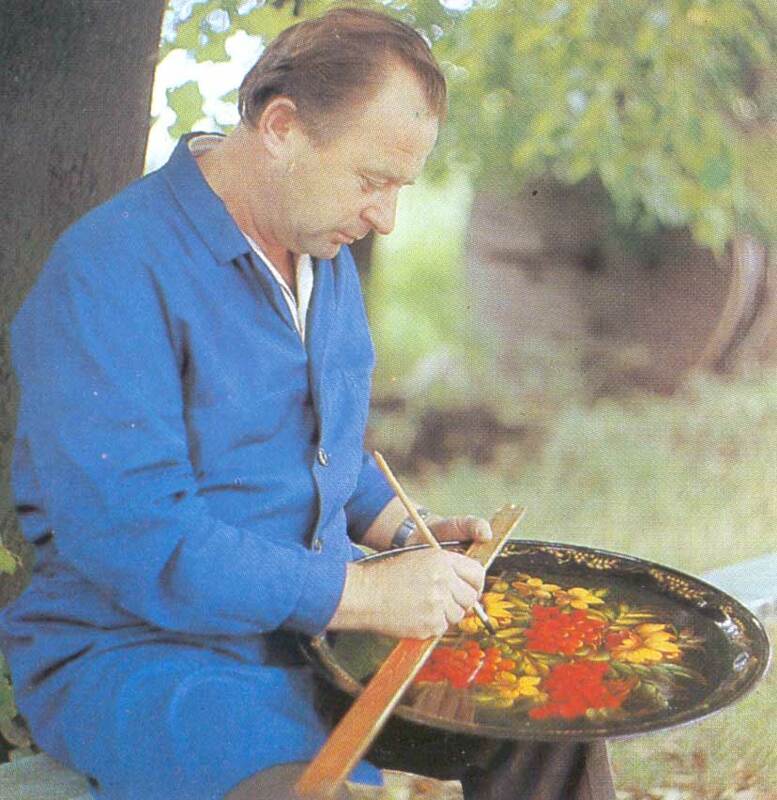 Painter Boris Grafov, Honoured Artist of the Russian Federation. Boris Grafov, Lacquered metal tray Spring, 1979, 62×80, Rosizopropaganda Republican Centre, Russian Federation Ministry of Culture. 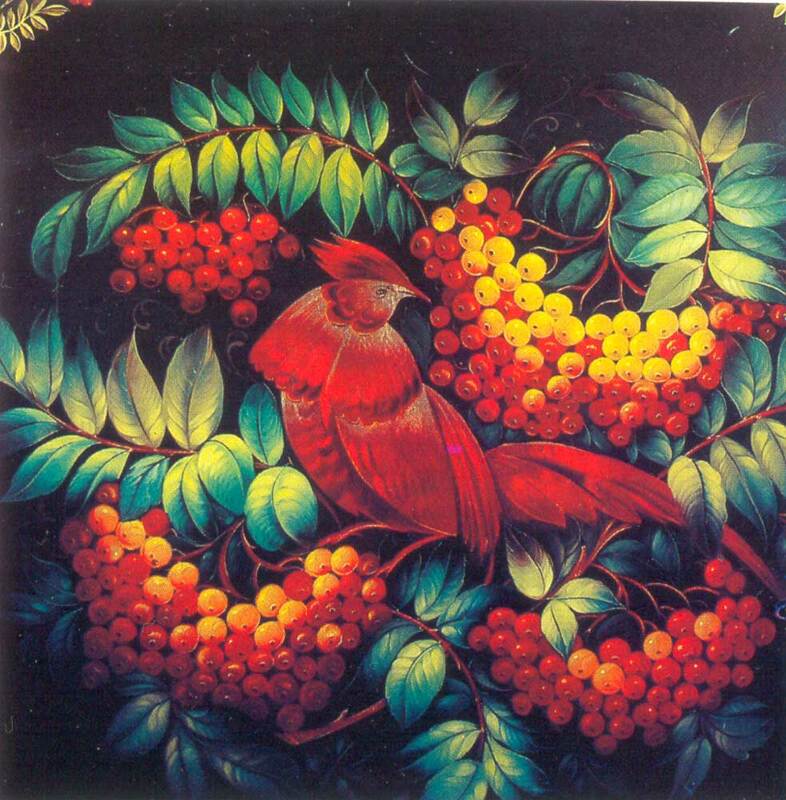 Nina Goncharova, Detail from oil painting on the lacquered metal tray The Fire-bird, 1974, Rosizopropaganda Republican Centre, Russian Federation Ministry of Culture. 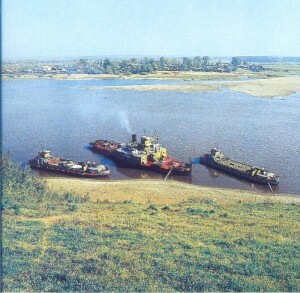 Dymkovo Suburb as seen from the Viatka riverbank. 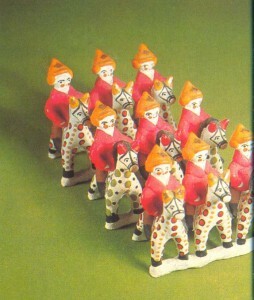 Nedezhda Davydova, Composition The Red Mounted Army in baked clay, painted in tempera, with gold-leaf decoration, 1969, Height 10, Rosizopropaganda Republican Centre, Russian Federation Ministry of Culture. 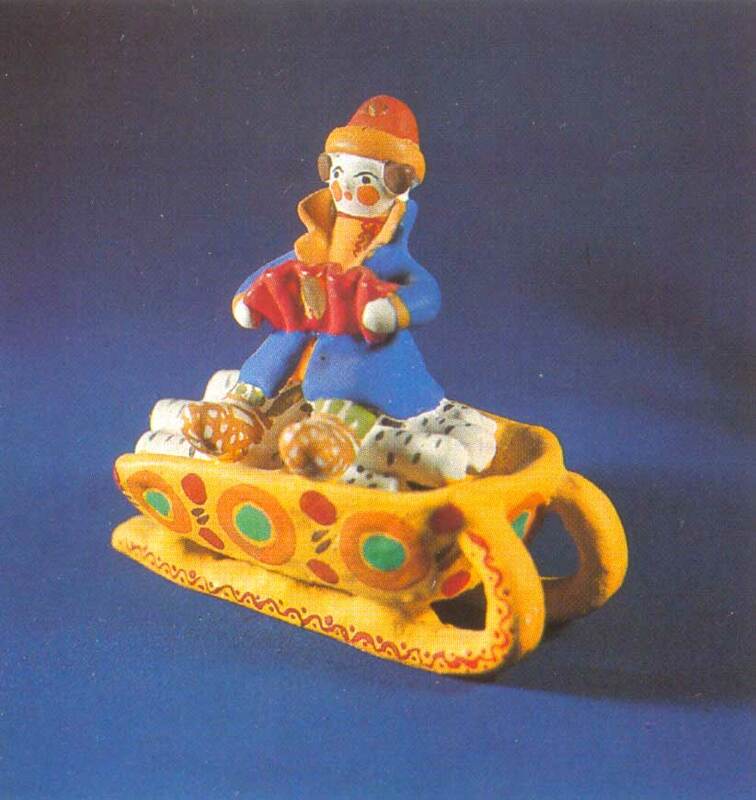 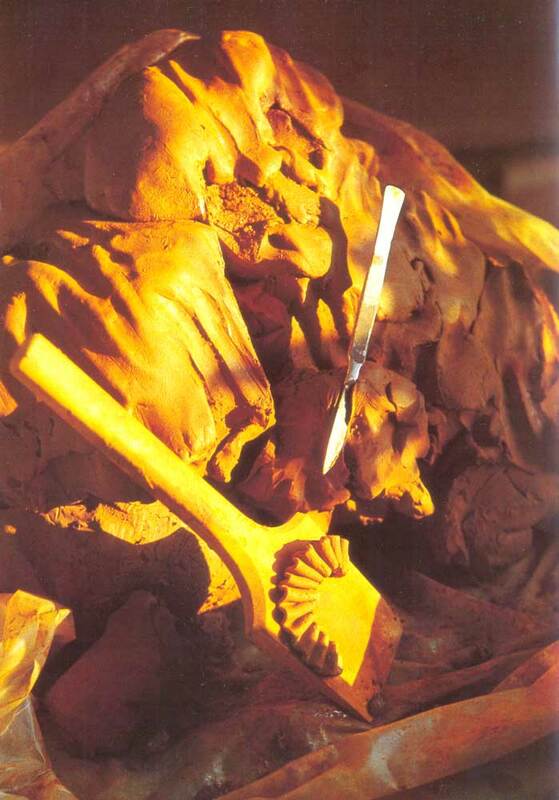 Anfisa Verozhtsova, Figurine of Yemelia in the sledge in baked clay, painted in tempera, with gold-leaf decoration, 1972, Height 14,Rosizopropaganda Republican Centre, Russian Federation Ministry of Culture. Alevtina Trefllova, Lenin Komsomol Prize Winner. 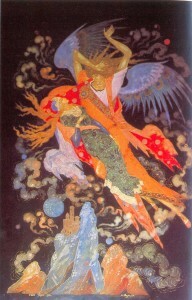 Anna Kuzminykh, Composition Ivan Tsarevich and the Fire­bird in baked clay, painted in tempera, with gold-leaf decoration, 1973, Height 16, Rosizopropaganda Republican Centre, Russian Federation Ministry of Culture. Lydia Falaleeva, Figurine of a woman. 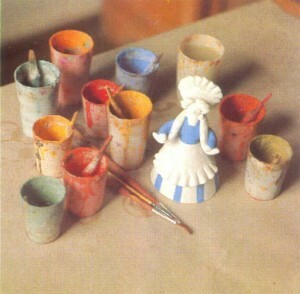 Lydia Falaleeva, Figurine of a woman in baked clay, painted in tempera, with gold-leaf decoration. 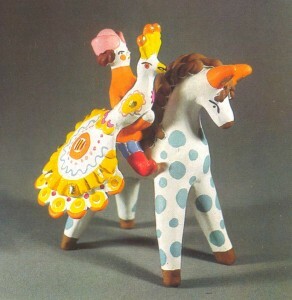 1972, Height 15, Rosizopropaganda Republican Centre, Russian Federation Ministry of Culture. Lydia Falaleeva, Composition The Round Dance. 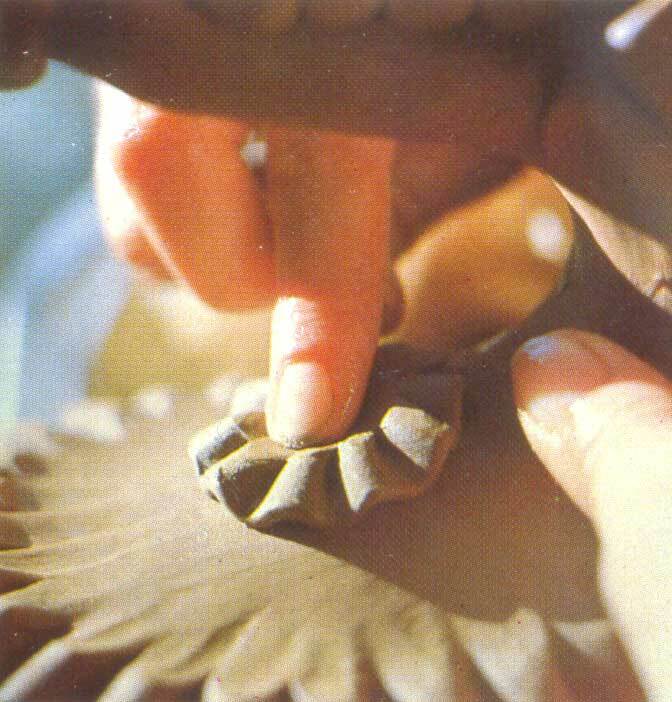 Lydia Falaleeva, Composition The Round Dance in baked clay, painted in tempera, with gold-leaf decoration, 1972, Height 30,Art Workshops of the Kirov Department of the Russian Federation Art Foundation. Lydia Falaleeva, modeller and painter of Dymkovo earthenware toys. 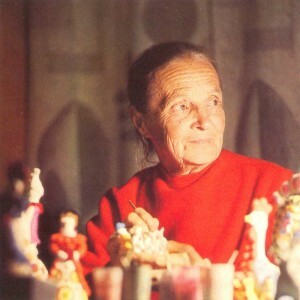 Ludmila Ivanova, Composition The Promenade. 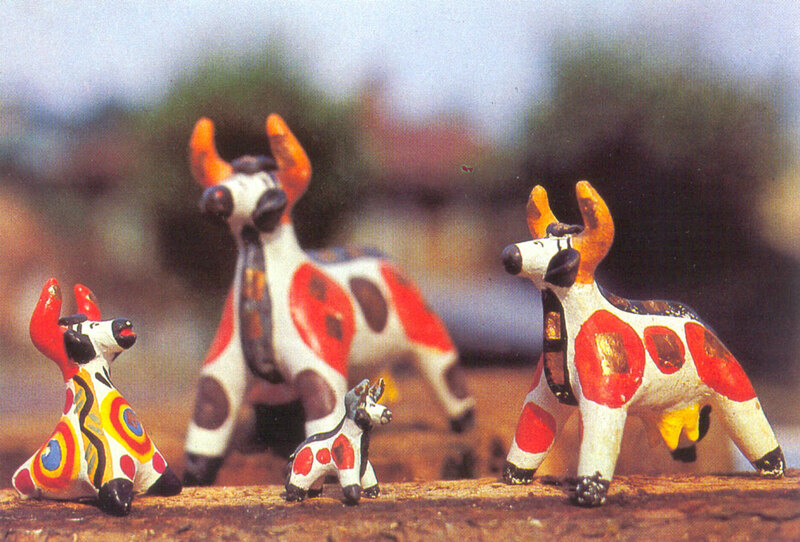 Ludmila Ivanova, Composition The Promenade in baked clay, painted in tempera, with gold-leaf de­coration, 1972, Height 18, Rosizopropaganda Republican Centre, Russian Federation Ministry of Culture. 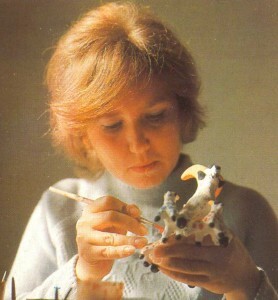 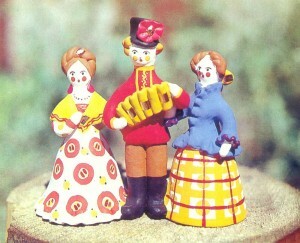 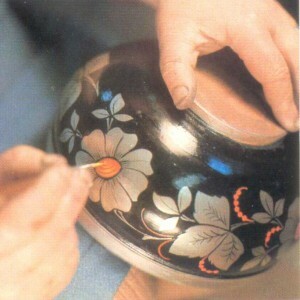 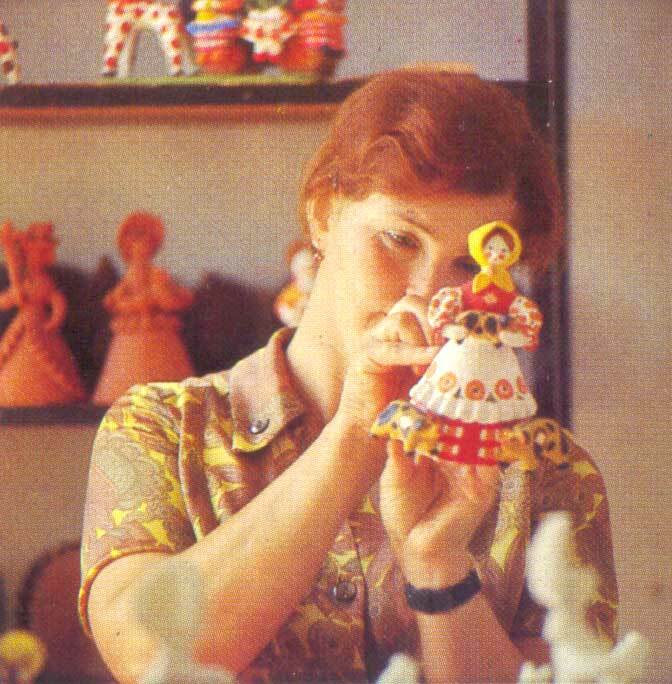 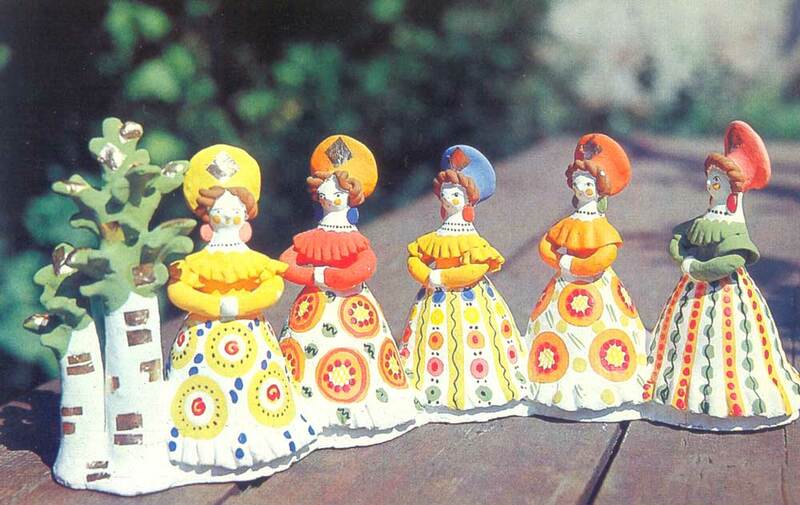 Ludmila Ivanova, modeller and painter of Dymkovo earthenware toys. 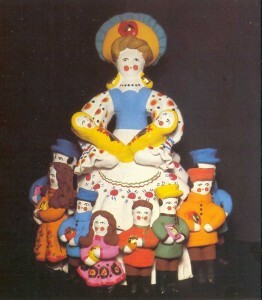 Zoya Penkina, Figurine of mother and her children in baked clay, painted in tempera, with gold-leaf decoration. 1970, Height 30, Kirov Regional Art Museum. 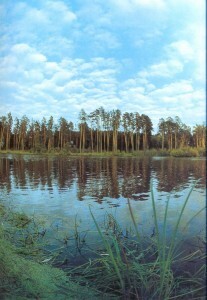 Zoya Penkina, Russian Federation Repin Prize Winner. 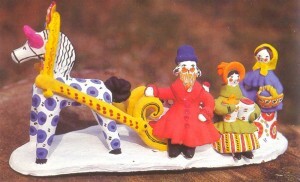 Olga Konovalova, Toys Cows and whistle. Olga Konovalova, Toys Cows and whistle in baked clay, painted in tempera, with gold-leaf decoration. 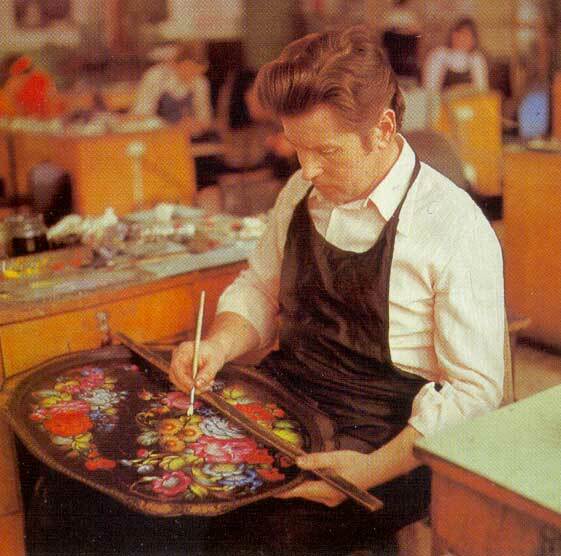 1969, Art Workshops of the Kirov Department of the Russian Federation Art Foundation. 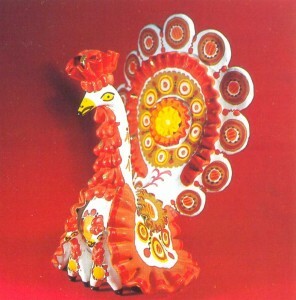 Galina Baranova, Figurine of a turkey. 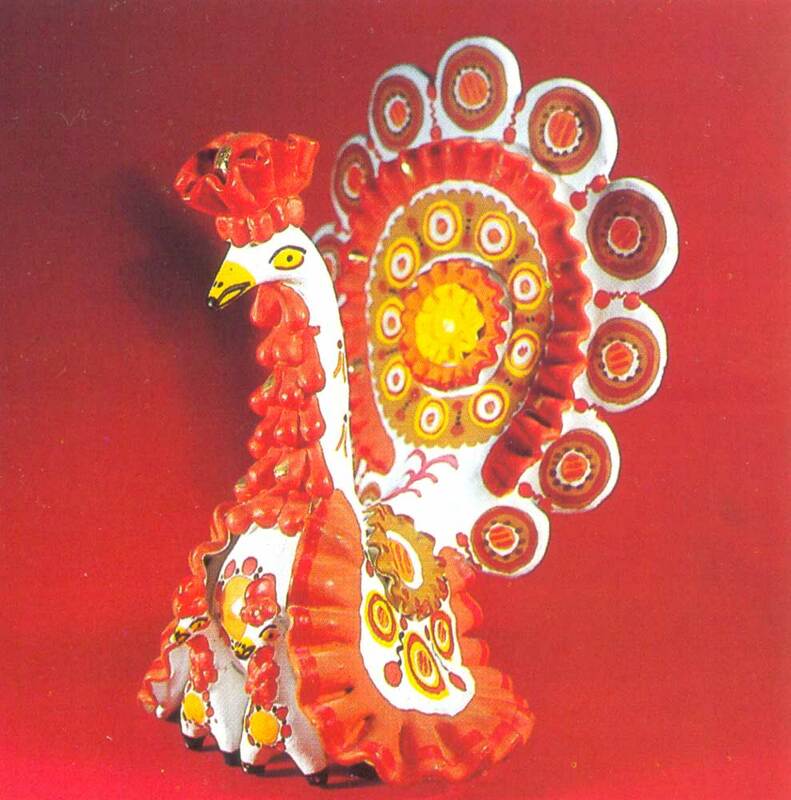 Galina Baranova, Figurine of a turkey in baked clay, painted in tempera, with gold-leaf decoration, 1975, Height 28, diam. 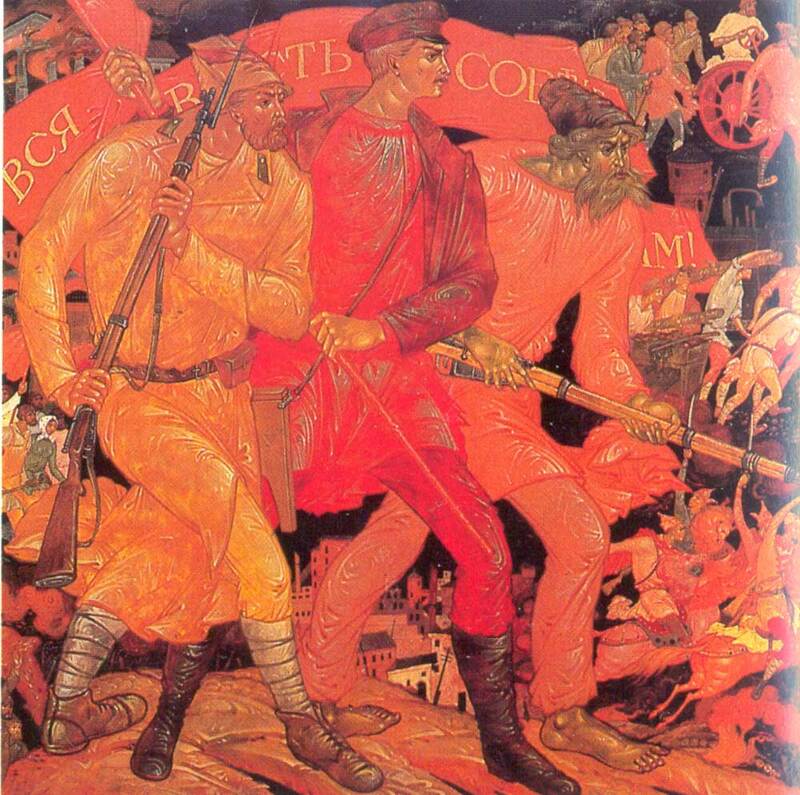 base 19, Rosizopropaganda Republican Centre, Russian Federation Ministry of Culture. 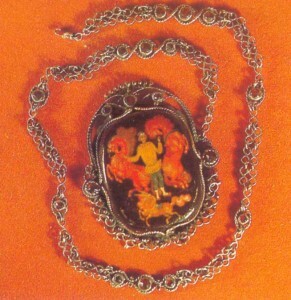 Raisa Smirnova and Liubov Kolovagina, Metal pendant decorated with garnets, with a papier-mache insert showing the Hunchback Horse painted in tempera and Gold, 1975, Rosizopropaganda Republican Centre, Russian Federation Ministry of Culture. 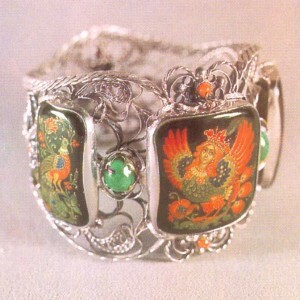 Lilia Zverkova and Liubov Kolovangina, Bracelet the Bird Sirin. 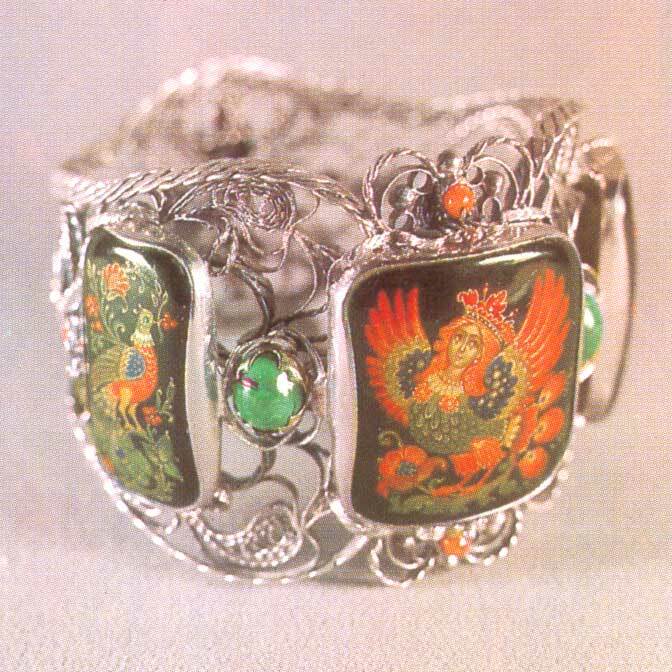 Lilia Zverkova and Liubov Kolovangina German silver bracelet decorated with malachite and coral, with a papier-mache insert showing the Bird Sirin painted in tempera and gold, 1978, Diam. 7, Rosizopropaganda Republican Centre, Russian Federation Ministry of Culture. 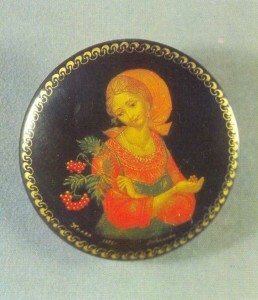 Irina Livanova, Brooch A Girl with Ashberry Twigs. Irina Livanova, Lacquered papier-mache brooch A Girl with Ashberry Twigs, painted in tempera and gold. 1976, Diam. 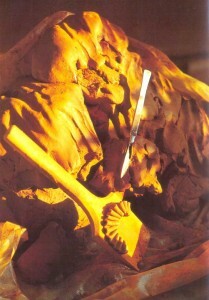 5, Museum of Palekh Art, Palekh, Ivanovo Region. 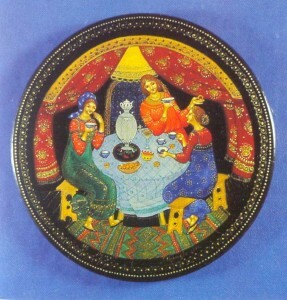 Larisa Konysheva, Powder-box A Tea-party. 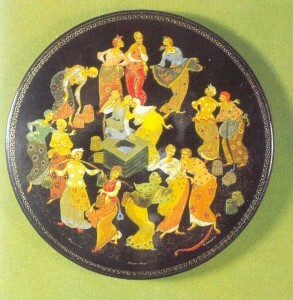 Larisa Konysheva, Lacquered papier-mache powder-box A Tea-party, painted in tempera and gold, 1975, Diam. 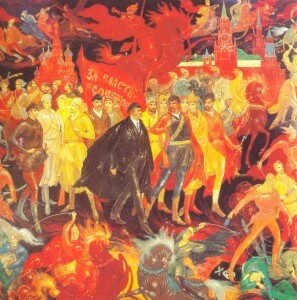 6, Rosizopropaganda Republican Centre, Russian Federation Ministry of Culture. 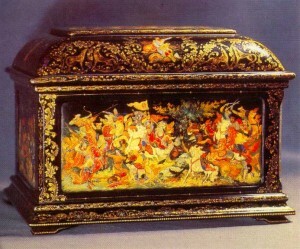 Nikolai Lopatin, Lacquered papier-mache powder box, painted in tempera and gold. 1975, Diam. 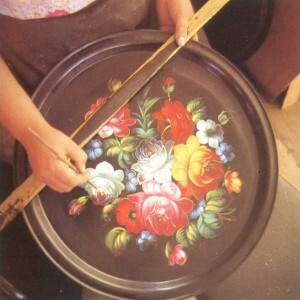 10, Rosizopropaganda Republican Centre, Russian Federation Ministry of Culture. Viacheslv Morokin, Plate A Festival in the North. 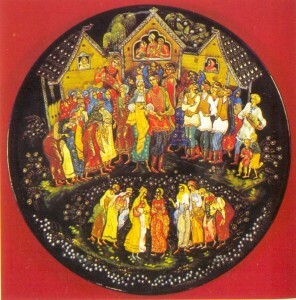 Viacheslv Morokin, Lacquered papier-mache plate A Festival in the North, painted in tempera and gold, 1974, Diam. 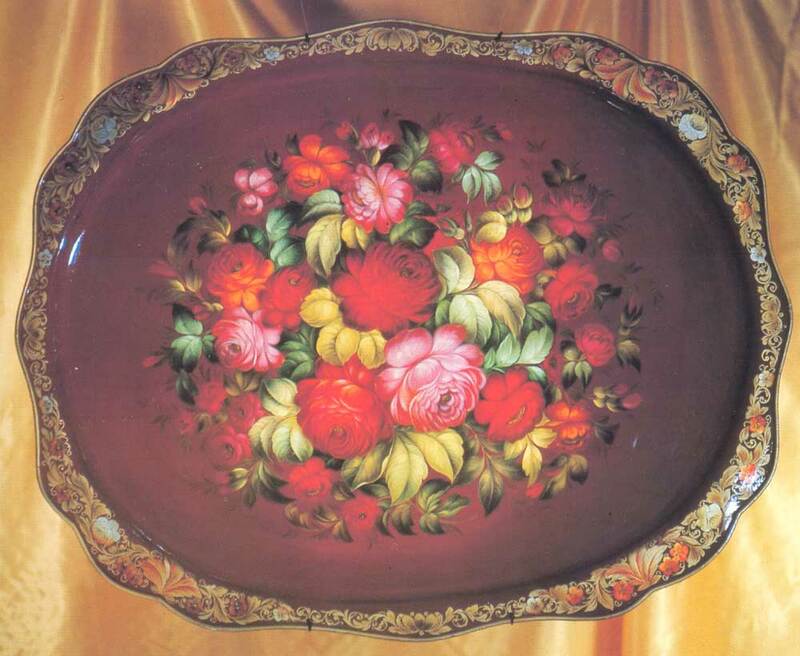 26, Rosizopropaganda Republican Centre, Russian Federation Ministry of Culture. 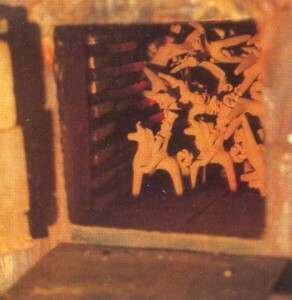 Tatyana Khodova, Detail of the box The Haytime. 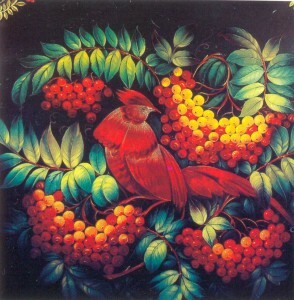 Tatyana Khodova, Detail of the lacquered papier-mache box The Haytime, painted in tempera and gold. 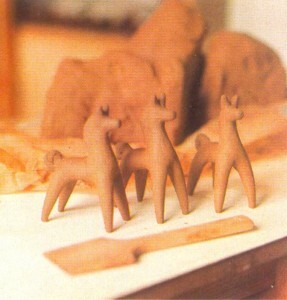 1976, Museum of Palekh Art, Palekh, Ivanovo Region. Nikolay Golikov, Detail of the box Stepan Razin. Nikolay Golikov, Detail of the lacquered papier-mache bo Stepan Razin, painted in tempera and gold. 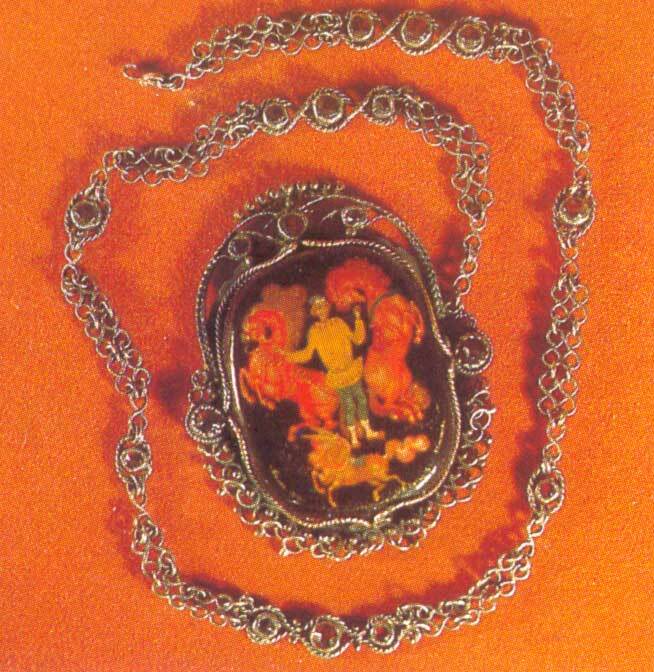 1977, Museum of Palekh Art, Palekh, Ivanovo Region. 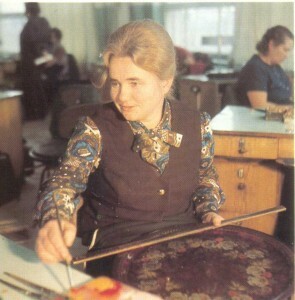 Painter Anna Kotukhina, People’s Artist of the Russian Federation. 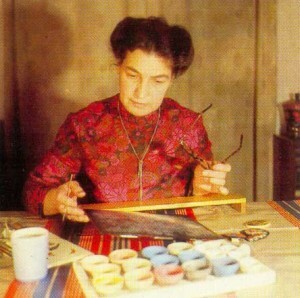 Painter Anna Kotukhina, People’s Artist of the Russian Federation, Russian Federation Repin Prize Winner. 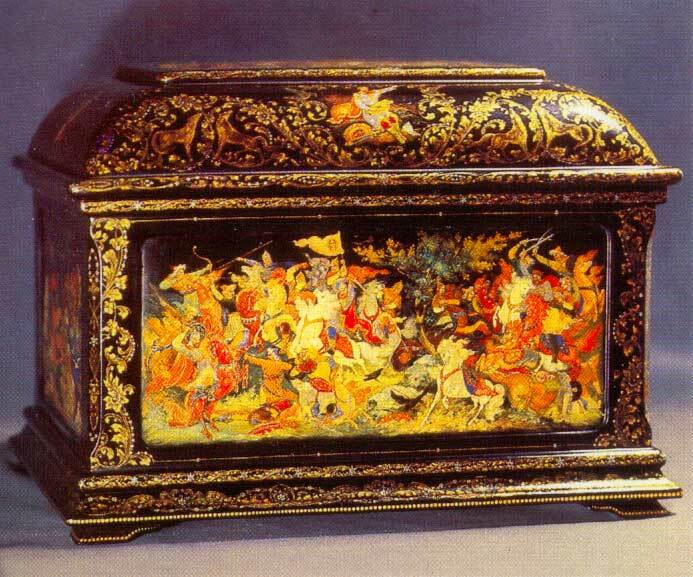 Anna Kotukina, Casket The Lay of Prince Igor’s Host. 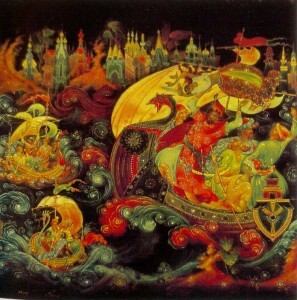 Anna Kotukina, Lacquered papier-mache casket The Lay of Prince Igor’s Host, painted in tempera and gold. 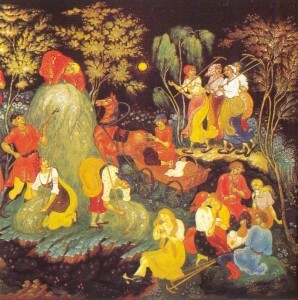 1956, 21x29x21, Museum of Palekh Art, Palekh, Ivanovo Region. 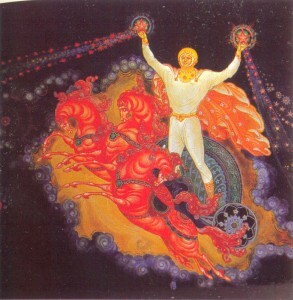 Alexei Kochupalov, Lacquered papier-mache plaque The Demon, painted in tempera and gold. 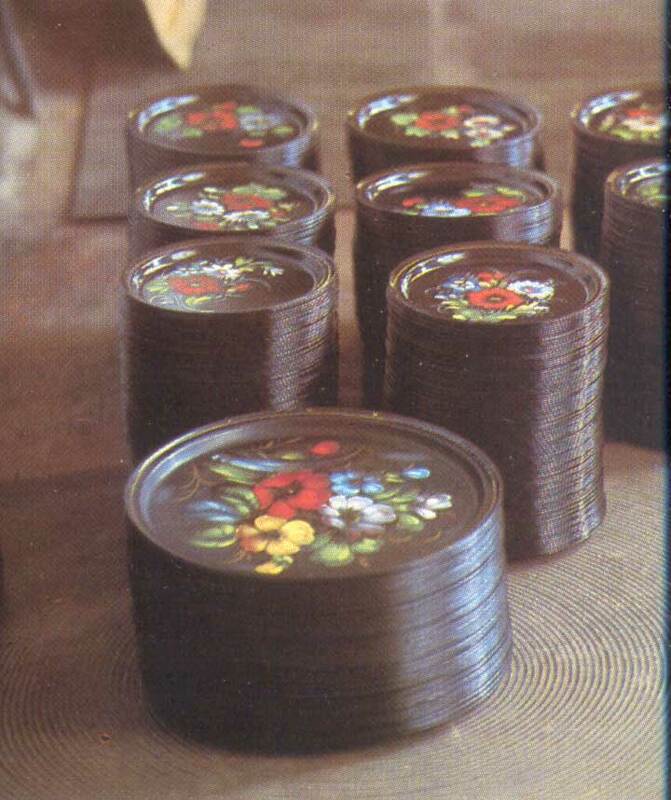 1972, 21x29x2, Museum of Palekh Art, Palekh, Ivanovo Region. Painter Alexei Kochupalov, Honoured Artist of the Russian Federation, Lenin Komsomol Prize Winner. 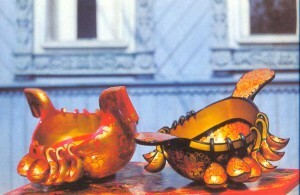 Gennady Kochetov, Box A Tractor. 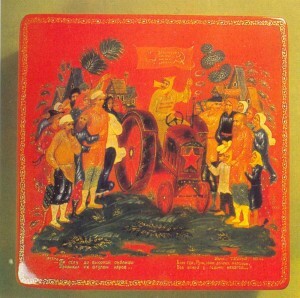 Gennady Kochetov, Lacquered papier-mache box A Tractor, painted in tempera and gold, 1974, 12×12, Museum of Palekh Art, Palekh, Ivanovo Region. Painters Klavdia and Boris Kukulievs. 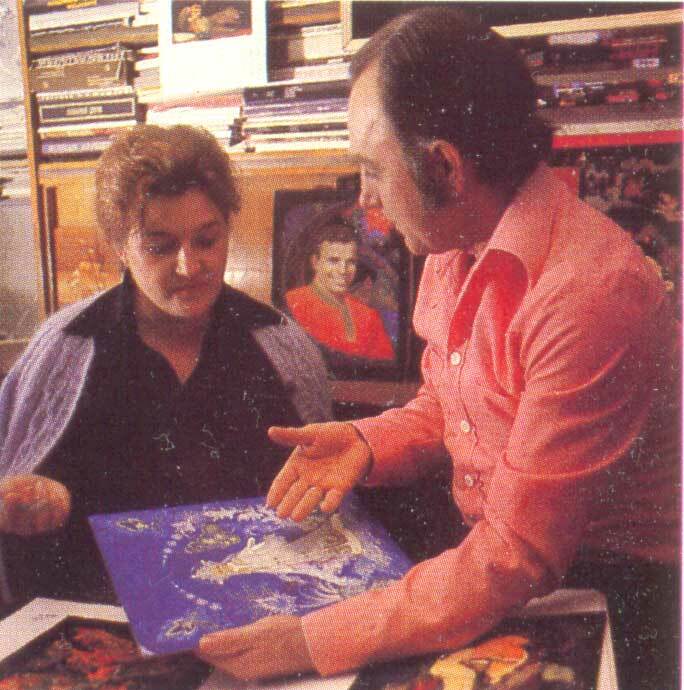 Painters Klavdia and Boris Kukulievs, Honoured Artists of the Russian Federation. Klavdia and Boris Kukulievs, Yuri Gagarin, detail of the illustration to the book The Son of Russia, painted in tempera and gold on lacquered cardboard, 1981. 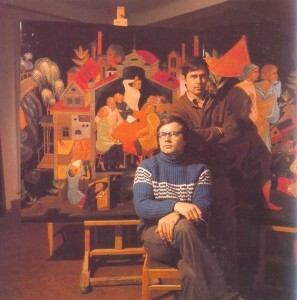 Painters Anatoly Peskov and Gennady Kochetov. Painters Anatoly Peskov and Gennady Kochetov, Lenin Komsomol Prize Winner. Anatoly Peskov, Detail of the lacquered papier-mache box The Flaming Years, painted in tempera and gold. 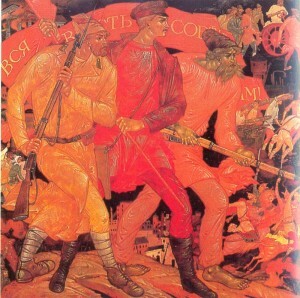 1969, USSR Central Museum of the Revolution, Moscow. Valentin Khodov, Lacquered papier-mache plaque The Wind of the Revolution, painted in tempera and gold. 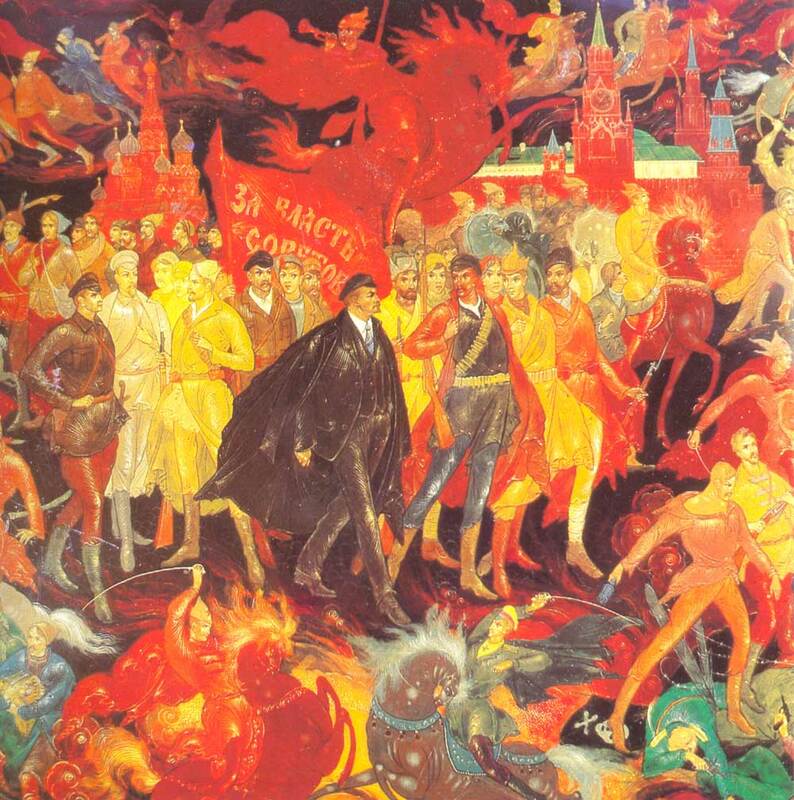 1969, 50×40 Rosizopropaganda Republican Centre, Russian Federation Ministry of Culture.